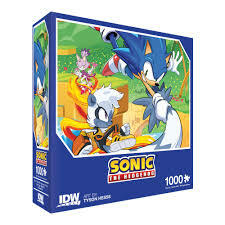 Back on June 26, IDW Games announced that they would be releasing a new series of premium jigsaw puzzles featuring some of their licensed products including Teenage Mutant Ninja Turtles and Sonic the Hedgehog! Focusing on the latter, as this blog is want to do, the 1,000 piece puzzle was scheduled to release on the 5th of this month and has begun to show up online and at retail stores across the country. The puzzle features the art from Tyson Hesse‘s issue #4 A cover, displaying Sonic and Tangle in the Emerald Hill Zone, as well as Blaze doing her thing in the background. Made from 100% recycled materials here in the US; this gorgeous collectible is retailing for $19.99! What do you think of this product? Glad to see more work promoting Hesse, or would you like to see another artist get the spot light? Excited to see Tangle get more publicity? What other things would you like IDW to use its license to produce? Let us know in the comments below! Thanks for your continued support of Sonic Source! We are coming up on our 100th article. A major milestone for us! Behind the scenes we have been continuously trying to improve the site and quality of the information provided! We have learned a lot in the past half year, and look forward to continuing it for years to come! Much more is coming down the pipe in the next few days, including: The release of IDW Game’s Sonic Crash Course board game, the August Sales Numbers Breakdown, the review of Issue #1, “The Battle for Angel Island, Pt. 1”, and solicitations for December’s issue #12! Check back regularly so you do not miss a thing! Things move fast in Sonic’s world! Previous Sonic the Hedgehog Vol. 1: Fallout! Review! Next Sonic #9 Previewed on AiPT!